The photograph below is taken from a collection of glass negatives dating from the 1900s discovered in a former industrial building in Newark-on-Trent, Nottinghamshire. 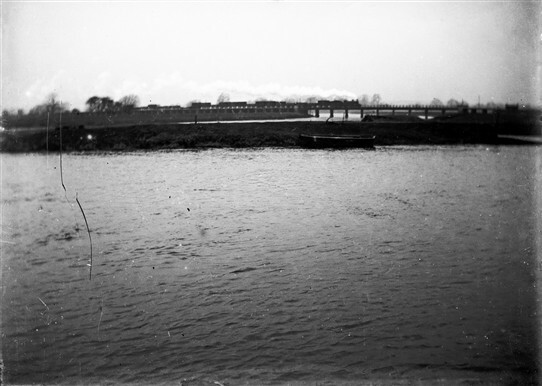 Some of the other photos in the collection definitely show scenes in Newark, so we may perhaps assume that this picture too was taken close to the town. Can you recognise the railway viaduct in the background which should confirm the location for us? If you can help, please add a Comment via the link at the bottom of this page. This page was added by Website Administrator on 20/09/2013. If this picture is near Newark, then could it be the viadict near Averham? The river looks a bit too wide to me for Averham. Could it be the one that crosses the Trent at High Marnham? Definitely the viaduct at Averham. It has the right number of spans. In the foreground is the branch of the River Trent that runs down to Newark. If the river seems a bit wide, it may be because the water level is rather higher than normal.